Qrank is a challenging and well-designed trivia game that enables you to compete against friends in daily rounds of 20 questions. It also allows you to easily post your results to Facebook or Twitter. The app from Ricochet Labs is designed for the iPhone but looks just fine when boosted to fit the iPad’s larger screen. 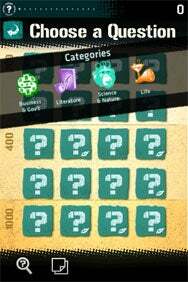 Quiz Show: Qrank’s board consists of questions in four categories, with some worth up to 1000 points. Each day Qrank provides you with 20 fresh trivia questions from four of seven general categories: entertainment, life, literature, history and places, science and nature, sports, and business and government. Depending on difficulty, questions are worth up to 200, 400, or 1000 points; the more time you take to select the correct answer from the four provided, the fewer points you receive. Points are not deducted for wrong answers. The questions are interesting and varied, and frequently submitted by users. (There’s a form on Ricochet Labs’ Web site that enables this.) The game is quick and simple to play, and lots of fun. As the developers warn, it’s easy to get hooked on Qrank, in part because of the social aspects of the game; even if you opt out of Twitter and Facebook connections and competing against friends, you’re still ranked against everyone else playing that day in your town, state, country, and the world. In addition, there are all kinds of “prizes” you can win, for accomplishments such as answering five, 10, 20, or 50 consecutive questions correctly, playing different numbers of days in a row, and so on. In its latest update, to version 2.0, Qrank added the ability to play “live” against other players either in the same location (say, a bar), or just against anyone in the world. This “beta” feature is promising; a “live” game played against four opponents from somewhere on planet earth (there was no location nearby where others were playing) was both fun and challenging, though a bit slow: there’s about a 30-second wait between questions. But in the end, all trivia games come down to how interesting the questions (and possible answers) are. And in this aspect, Qrank is terrific.